Even though this is a couple of years old, I enjoyed writing this way too much not to re-share it. Bring on the controversy! After reading about a New York Times essay contest, I spent maybe 10 minutes trying to think of an angle I could use to write about why I think eating meat is ethical. This was their prompt…”Just tell us why it’s ethical to eat meat.” The rules specifically state not to talk about organic versus local, personal choice or preferences. A tough question, now made tougher, with a 600 word limit to boot. Ethics have always played a huge part in my life. I am personally ruled by my heart and try to live by what I feel is right and moral. Any movements outside of the principles of my conscience can send my whole life spinning out of control – awakening unnecessary anxiety and the ever-useless emotion of guilt. I have considered that I actually apply ethical value to my dietary habits, albeit in a roundabout way. I am extremely passionate about health and nutrition; I place very high value my personal health, as well as the health and well-being of my loved ones. If I were to eat something that I know to be toxic or bad for me, it would be outside of my personal values and ethics. Therefore, eating something that I know to be good for me is well within my ethical standards. I completely understand someone’s ethical decision not to eat meat, and will get along fine with those who have made this choice, as long as they are not trying to tell me that it is the healthiest choice. In fact, I would probably be a vegetarian if I thought that it was even a remotely healthy option for me. I absolutely hate the fact that an animal has to die in order for me to get valuable nutrients. What upsets me even more is the way that over-farmed mono-crops are destroying our land and topsoil. So many animals may have made their homes where that corn or soybean field now lies. What I truly hate is that we are depleting the environment of everything it has to offer, in order to produce more and more, faster and faster. It seems a very fine line to me. What further devastates me are the hormones, antibiotics and grains used to raise cattle in unhealthy and unsanitary conditions, in order to mass-produce conventional beef. Because of this, I choose to buy my meat from grass fed, humanely raised and slaughtered sources. I believe in working with the environment and following the natural order of things wherever possible. 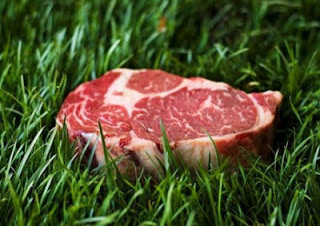 I I believe that the value of the nutrition in meat is worth some sacrifices. I will even go cliche` and call it the “circle of life.” This is simply part of what I need in order to keep my mind and body in prime working condition. I want to be an active participant in this life and I want to enjoy my time on this earth as much as possible. So is eating meat ethical? As long as I value my personal health and well-being, then it is the very core of ethics. Slowly killing myself to save an animal is what seems unethical. This really is just one of those tough questions there will never be a concrete answer for, as long as we are graced with freewill. I can only hope that we apply common sense and self-education to our choices. Please share any thoughts on this? Thank you Mark Sisson, for the heads up on this, and the chance to be heard!